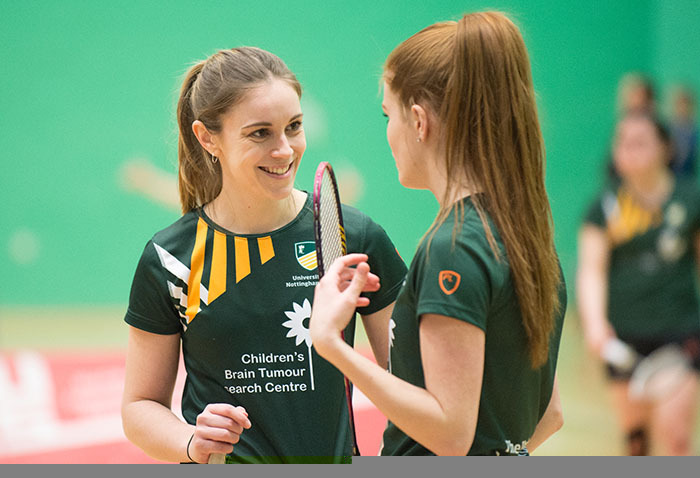 The first UoN team to take to the court on BUCS Big Wednesday looking to secure the first silverware was the women’s badminton 2’s at David Ross Sports Village. The team narrowly missed out on a BUCS title to Loughborough over the course of the regular season in Midlands 1A and their opponents, Durham Sport 1st team were equally keen to get off to a winning start. Hilda Ho took on of Durham’s Becky Boyle in the opening game of the match and immediately started the stronger mixing her play up early on. Boyle tried to counter to get back into the set but was unable to get her lob going and a number of unforced errors strengthed Ho’s lead. Ho went on to win the first game 21-17 with a brilliant cross court forehand smash to stamp her mark on the match. The second set was far from plain sailing and Boyle caught Ho out a number of times with fine touches at the net. It was Ho who had to react this time, and fought hard to go into the break 11-9 up. After a breather, Ho raised her game and only needed the 2 of her 4 match points to win a close fought 4-shot rally to win 21-16 , 2-0 in straight sets. On court 2, Nicola Ho played in a nervy first set and she slid to 11-17. It was a tentative affair with a lot of touch play at the net but Bong dominated the net late on setting up some smash returns to grow her lead and eventually took the first set. Ho came out second set and missed a short touch at the net to take a 3-0 lead which would have been the perfect start. The pair traded cross court winners to level the tie at 6-6 and unenforced errors cost Josh Myn Bong in the second set and Ho led 11-9 at the break. took the 2nd leg 21-15 to level the match 1-1 in sets. There was nothing to separate them in the third set as the ladies battle out to 17-17. Ho edged ahead and took an 18-17 lead with a powerful smash down the line to swing the tie in her favour. Bong glanced a shot off the net which didn’t put Ho off and her return was too good, Bong sliced her return shot wide at match point and the set and match was UoN’s. In Doubles action, Becky Blair & Lucy Jarvis took on Durham’s Alex Langley and Emma Smeethurst and dropped to an early 0-4 defecit. Langley and Smethurst started quickly and won the early exchanges and continued their great start to go in at 2-11 at the first break. Blair and Jarvis rallied back but Durham were too strong taking the first set 8-21. Second set started off as a much closer affair, with a scores level early on at 3-3 , but Langley’s play at the net was too intricate and too clever and Durham again led at the break after a flurry of points. With Langley quick to answer Jarvis at the net, it was a tough second set for the UoN pairing and whilst they fought to get back into the match Durham stretched their lead and finish on top winning the final set 6-21. The Nottingham pairing got off to a perfect start winning 21-15 and continued their form into the second set forcing an error to win 4 match points at take the score to 20-15. Durham fought back and saved all four to take it to extra points with all four players trading powerful volleys in heated exchanges. This game was crucial in the context of the match and could have flipped the tie on its head. Durham went ahead with a great shot from Olivia Trevor but it was Trevor who missed a forehand shortly after to bring it back level. Chan delivered a dipping volley at 21-22 and Trevor’s final shot was unreturnable to win 21-23 and level the match up 1-1. The final set was more straight forward with the UoN pairing never faultering. Kaur smashing a return hard and low to win take it to 13-19 and when Mahenthiralingam got the better of Chan after the piar exchanged 10 strokes in a rally it set up match point for the Green and Gold. When Chan found the net moments later UoN took the final set 14-21 to win 2-1 in what was a brilliant game of badminton. With the game on the court next to this going level and potential squaring the match the pressure was on Nicola Ho to deliver. Ho was 12-8 up and in control of the 2nd set when she took an unfortunate tumble, twisting her already heavily strapped right knee and putting the entire fixture in doubt. David Ross Sports Village Sports Injury Clinic physios were on hand and raced to her assistance but the outcome was not good. Captain Becky Blair sat alongside Ho , who was clearly in distress in the middle of the court to comfort her. Ho eventually had to retire and after being helped to her feet was taken off for an assessment. The outcome was the match hanging in the balance at 3-2. Hilda Ho came out in the first set looking to edge UoN closer to trophy victory but at a break was 7-11 down, Bong finding her touch at the net with a fantastic short game. Ho clawed it back to 15-16 with a delightful drop shot at the net fooling her opponent but went on to lose the first set 21-16. The second was a tense affair and the pressure was on with the crowd building and the bleachers packed. Bong was eventually too strong and powerful for Ho and the Durham top seed won the final set 21-15. This would turn out to be the deciding game with the match locked at 3-3 in games. This time Langley and Smethurst didn’t have it all their own way, with Mahenthiralingam and Kaur starting powerfully but that didn’t stop them from taking the first set. Normal service resumed in the second for Langley and Smethurst who went on to win 17-21 and at at the handshake it was Durham who were ahead in the tie for the first time in the match 4-3. UoN took a 6-1 LEAD with a number of wonderfully crafted early shots with Tait and Jarvis’s short game coming good. Not wanting to let this crucial game slip, Olivia Trevor pulled out 5 brilliant points to level things up at t 6-6 and Chan’s movement at the back of the court let Durham to at 10-11 lead at the break eventually going on to win the first set. 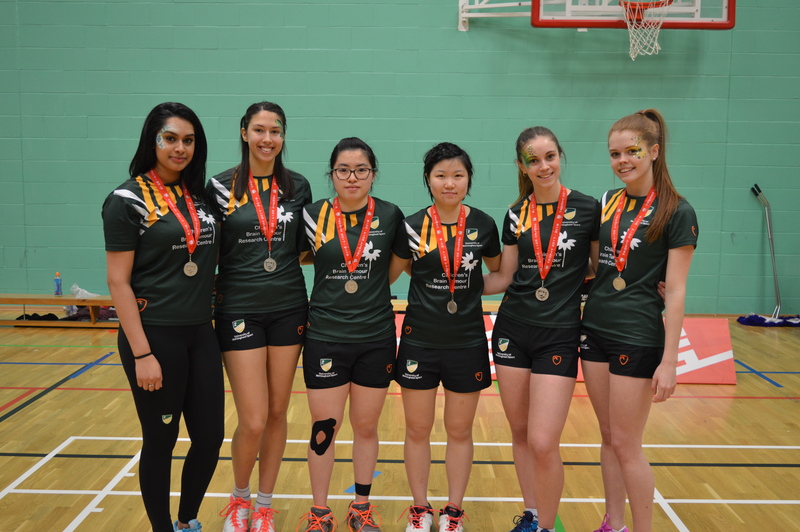 It was a close matchup in the second, with long gruelling rallies and UoN stayed in touch. When Jarvis missed a shot down the line it took the score to 18-12 and Durham were moments away from victory. A 5 shot rally confirmed the finish and the victory for Durham. It was a disappointing end to an extremely high-quality trophy match with both teams battling it out for the cup. Immediate thought swill be for the health of Nicola Ho who left the court seriously injured and we hope she will go on to make a full recovery. Congratulations to Durham, who thoroughly deserved their victory this afternoon.